Last Thursday and Friday we had the opportunity to go to the Festiberico Film Festival, which is held in Delft (the Netherlands) every two years showing the best Portuguese and Spanish films from the last two years. We had (in our place) a special guest who was participating in the festival with a very funny film of which I will tell you soon about. Marcos Cabotá is Mario’s cousin and film director who’s funny and very social demeanor made him the dearest person among the people during his participation in the event, mostly during the presentation of his film “Amigos” (Friends). This movie was fresh, funny and with a very simple plot: four friends that have always bet about every single thing. Until one day one of them dies leaving a 17 million euros’ inheritance. The deceased had prepared a posthumous bet: the fortune will belong to the one who reaches more TV rating until the 31st of December. Obviously, so many things happen along the way making it difficult for either of the friends to win the bet. It was fun! Something I really like about the movie was its ending, totally unexpected. After the film, we (Marcos, Alberto – one of the main characters – other people that I don’t know, Mario and I) went to eat delicious Argentinian food, drank some wine and chatted about life. 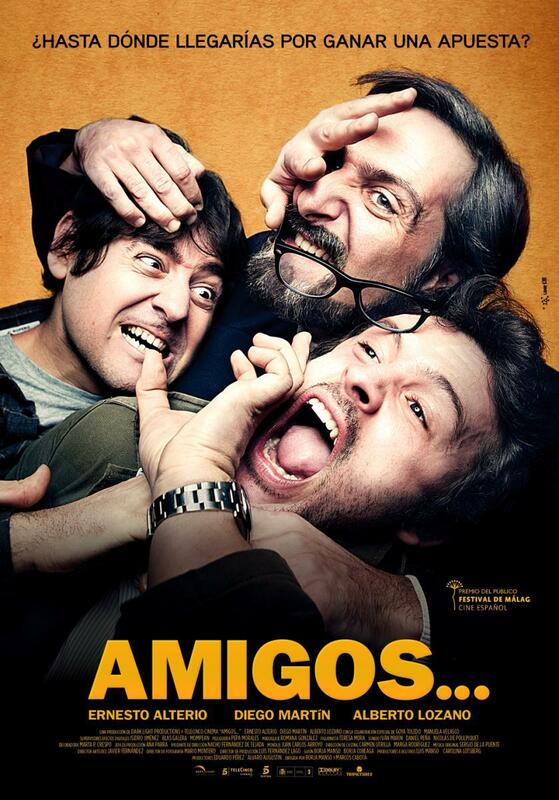 Now, on Thursday (“Amigos” was screened on Friday) the film was not as good but the company was awesome. “No habra paz para los malvados” (No rest for the wicked) is a dark, drama/action film that had won 6 Goya Awards (like the Spanish Oscars) including best film and best actor. Despite all the awards and international acclaim, I didn’t like it mostly because of the missing links between the main character (Santos Trinidad) and the bunch of things that happen to him. The best thing about the movie was Santo Trinidad, who was cruel and cold blooded. As for the rest, it was a deception! My boyfriend and his cousin gave it a second chance and they understood it better than me and Jagoba (our Basque friend). Afterwards we went for the Argentinian restaurant i told you before. We had so much fun there, eating, telling jokes and making fun of each other. I laughed so hard that I couldn’t breath, causing myself a very silly laughing-out-loud-headache. Soon I will write about flowers, again! I can’t help it, living in the Netherlands – the major flower-exporting country in the world – doesn’t make it any easier.